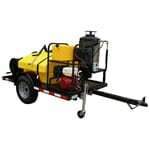 Trailer pressure washers are used exclusively by professionals due to their large size and respective price tags. A lot of these units come attached to the trailer so you don't need to buy one of those separately. Depending on your access to water on the go, the size of the water tank could be a determining factor in your purchase - the bigger the better, but also heavier. If you make your money power washing, these are well worth the investment. You can't beat the combination of size, portability and cleaning power. They come in cold or hot water so you're sure to get the best trailer power washer for your application. Truck & skid mount pressure washers give you very powerful cleaning capability in the bed of your own truck. They're similar to the trailer mounted units, except most do not have a water tank, so you'll need a water source. Look for units with electric start to save your arm a workout. 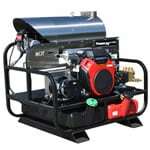 Hot water truck mount power washers are terrific for cleaning greasy or oil-stained areas such as parking garages. If you need to clean stables or a kennel, just pull your truck close and clean away. Professional Vehicle Mount Pressure Washer Buyer's Guide.. Our Power Equipment Direct how-to library can help you learn about Proposition 65 Product Labeling, Sales Tax Information and Product Recalls for Pressure Washer Equipment.